Now that Thanksgiving has passed, all thoughts turn to holiday decorating, baking, and shopping for that perfect gift. Statistics show that more and more people are shopping online for gifts. Sometimes the gifts are even delivered directly to the gift recipient rather than the gift giver. That new process obviously saves time and effort for the shopper who may already be weary after baking dozens of cookies! Give a Gift Certificate toward a stay at Hawthorn B&B in Independence, MO. We make it easy for the purchaser because you can simple call us at 1-816-252-2607 OR purchase online. You can decide what size (what value) you want the gift certificate to be. It fits you, as the giver, AND it will fit the recipient because they can decide how long to make their getaway partially based on the amount of the gift certificate. A stay at our B&B is relaxing – that’s something different from everyday stresses of jobs and other life commitments. Imagine what a blessing this gift certificate would be to a caregiver, your cleaning person, or maybe a religious leader. Just one night away from the usual daily pressures can be refreshing and leave the guest renewed for their next challenge. Many people may see a stay at a B&B as an extravagance. Help someone feel pampered with a stay in a bed dressed with luxurious linens and then wake up to a delicious full, hot breakfast made just for them! They may normally choose a budget lodging option – but a stay at Hawthorn B&B will allow them to appreciate a few nicetiesof life during their getaway. We make it easy for you to purchase any size gift certificate! Simply call us at 1-816-252-2607 and talk to us about all the details and any special packages that you may want to add to the getaway. Or you can purchase a Gift Certificate online through our website and have it emailed directly to the lucky recipient! 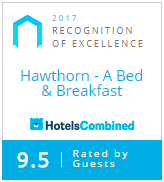 By the way, YOU should also plan a getaway to Hawthorn B&B! We love to pamper our guests and you deserve a relaxing getaway after all the holiday celebrations are over and “cabin fever” begins to set in. Make a reservation for yourself soon! This entry was posted in Hawthorn, Holidays, Shopping, Uncategorized by admin. Bookmark the permalink.